George Eastman and Horst Frank star in Ferdinando Baldi's well written Spaghetti Western. Wild East US R0 DVD. Bill Dakota rides into a small town with his wife and young son - he is being chased and runs to the sheriff for help, but the sheriff refuses to aide an outlaw and leaves Bill to his fate at the hands of Gary Stevens (George Eastman) who wants a map to a goldmine that Dakota cheated him out of. Bill's brother Ken rides into town to discover who murdered his brother and along with a local coffin maker, he sets off south to Mexico to find the killer. Stevens meanwhile tries to make a deal to open the goldmine with wealthy Chris Malone (Horst Frank) who owns large amounts of land in Mexico (and finds his amusement in setting local people against each other in gladiatoral combat to the death), but Stevens soon finds himself being double crossed by Malone and the pair start to try and out manoeuvre each other to get posession of the map. It is obvious from the first few minutes that Hate Thy Neighbor is a much more character driven production than a lot of Spaghetti Westerns and throughout the film the emphasis is on storyline over action. The story itself takes a basic revenge theme and builds on this with a web of double crossing between the villains that keeps it interesting throughout and it certainly has enough going on to keep the pacing from ever becoming slack without resorting to token action scenes - it builds up to a tense climax which provides a chance for some exciting gunplay. Even the comedy elements, often the downfall of a Spaghetti Western, are well integrated into the script and the coffin maker character who could have been very grating is instead an enjoyable addition to the proceedings. The only aspect that could have used some further development is the romance between Ken and Peggy which is discussed a few times but never evolves (although on the plus side we are spared the typical dragging romantic subplots of many American Westerns). The most unique aspect of the film is the gladiatoral combat that Malone subjects local Mexicans to for his amusement. Something that could have come across as completely gratuitous actually works very well, highlighting the genuine evil streak in the character in a very original way. 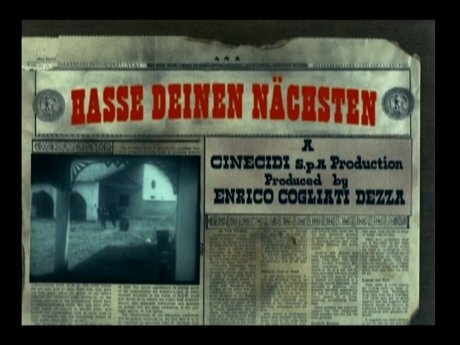 Ferdinando Baldi's direction is usually typified by solid camerawork for the most part with moments of flair and that is exactly what we see here with a few creative sequences (including a very unusual title sequence made to look like a newspaper) but a generally straight forward presentation. The more American flavour of the film conveyed by the storyline is emphasised by Baldi's narrow picture format - rather than emphasising the grand scale like the scope format could achieve, it helps to provide more intimacy to the all important dialogue scenes. The guitar heavy soundtrack from composer Robby Poitevin (responsible for the Spaghetti Western musical Rita nel West (1967)) provides a very solid backing to the film including a ballad title theme, popular in the genre's early days. Only one track, at the film's conclusion, does not work so well, sounding rather too light hearted. Although making a few films in Italy (including Luchino Visconti's drama Rocco e i suoi fratelli (1960)) Greek actor Spiros Focás was a relative unknown outside of his own country but takes the leading role here and gives an acceptable if unmemorable peformance. Returning as the villains from Baldi's Preparati la bara! (1968), George Eastman gives another strong turn while a very tanned looking Horst Frank again plays the sophisticated villain, prepared to let his men do the dirty work while sporting his ubiquitous white suit. A few familiar faces crop up in the rest of the cast including Nicoletta Machiavelli (Un fiume di dollari (1966)) as the love interest Peggy and Paolo Magalotti (Sette pistole per i MacGregor (1966)) in a larger than normal role as Malone's chief henchman. From the detailed script to the solid direction, it would be easy to mistake Hate Thy Neighbour for a traditional American Western - only the familiar Euro-cult faces betray the film's Italian roots. The end result is recommendable to fans of both the Italian and American genres who prefer plot and character over gratuitous gunplay. Directed by anyone	interesting? Ferdinando Baldi - probably best known for his work on Spaghetti Westerns from the rather tame Texas, Addio (1966) to the superb Preparati La Bara (1968) and the completely surreal Blindman (1971). Any gore or violence ? Some blood during the gladiatoral scenes. Who is it for? Spaghetti Western fans will find plenty to enjoy in this above average entry. The fullscreen print seems to be correct, with no evident cropping. The print is slightly windowboxed throughout. Picture quality is good, with minimal damage and good colours although slightly soft detail throughout. Some hiss and cracking in the background throughout but the dialogue and music are always clear. Trailer - as Hate Thy Neighbor with an English voice over. Fullscreen, low print quality. An 40 image gallery of press-book, promotional images, lobby cards and video covers - largely for Django the Last Killer but including some for this film. As a video file with music and chapter stop scrollable. Additional features are included on the disc for the other included film Django the Last Killer. Availability Only available as a double feature with Django the Last Killer. Other regions? Released in Germany by Koch Media as 'Hasse deinen Nächsten' with English, German and Italian audio, better picture quality and a twenty minute interview piece with Ferdinando Baldi and George Eastman (in Italian with only German subs). Cuts? Cut status unconfirmed, no obvious cuts. The film's title is German but all other text during the title sequence is English. A storyline based Western with good characters, solid direction and acting. Recommended. A fine looking DVD and a good value double-bill although the German disc offers better picture quality. Find our other reviews of Spaghetti Westerns and films directed by Ferdinando Baldi or starring Horst Frank. All text in this review written by Timothy Young - 29th March 2010.